Instapaper has been a favorite app among iOS users since the app first launched in 2008. Now, Instapaper users have another choice when it comes to digesting their saved Instapaper articles with Readomator for Instapaper (Mac App Store link). 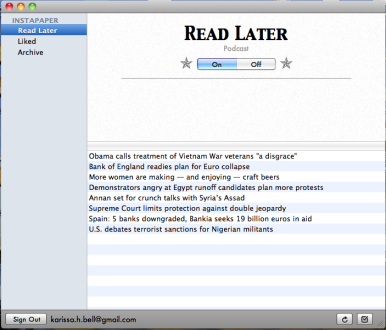 The Instapaper client converts your saved Instapaper articles into podcasts with iTunes. Launch Readomator, sign in with your Instapaper account, and you are greeted with a list of your saved Instapaper articles. 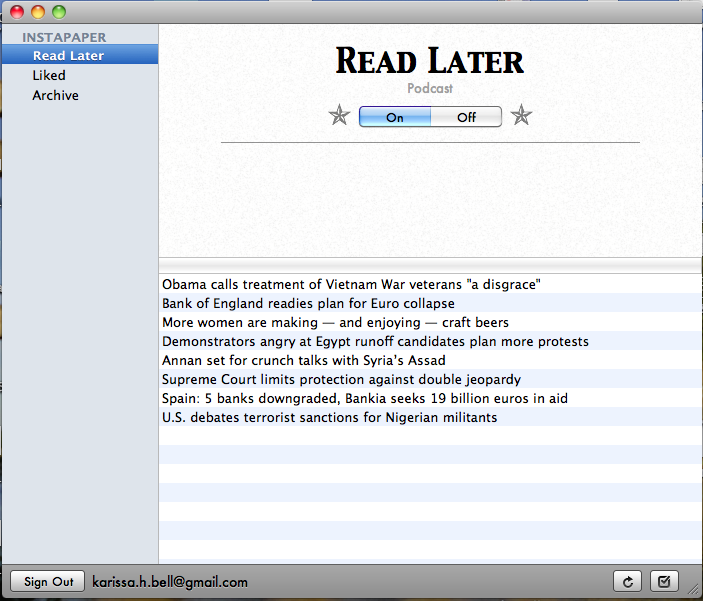 Turn on the podcast switch, and iTunes launches and begins to convert your saved articles into podcasts, which you can then download in iTunes. The integration with Instapaper is overall seamless. You can view and convert not only your currently saved articles into podcasts, but also your past articles from the Liked or Archive sections of your Instapaper account. By default, Readomator is set to run in the background (but you can disable this if you wish) and it checks for new articles every hour. You can set the frequency it refreshes from every 10 minutes to every day; you can also manually refresh. As far as the podcasts themselves, I found the quality surprisingly clear, though getting used to the cadence of the unnatural automated voice took some getting used to. (Tip: Play around with with the voice settings in Readomator’s Preferences until you find a voice and a speed that works for you.) It did have some trouble reading back certain names and abbreviations, but these hiccups were few and I didn’t find them to be disruptive to the rhythm of the podcasts. The podcasts usually run between two and half to six minutes in length, depending on the length of the article. One issue I did have with Readomator is it sometimes continued to read text that was on the page for several seconds after it reached the end of the actual article, repeating certain parts. I suspect, in some cases at least, that this had more to do with problems with the way the articles were formatted, rather than issues with Readomator itself. While I still prefer reading my Instapaper articles, Readomator is a good choice for those who prefer listening to audio versions, or who have a big backlog of Istapaper articles they wouldn’t otherwise have the time to sit down and get through.